On my way to work this morning I thought I would take a quick stop at Inwood Hill Park way up on the far northern tip of Manhattan. The park is barely out of my way to my office in New Jersey so I figured I would be remiss in my birding if I didn’t take a few minutes to check in on the Dickcissel that has been there for a couple of weeks now. Having missed every Dickcissel in New York State in 2011 I wanted to make sure that I spotted one this year which is why I found myself suffering a cold wind off of the Hudson River shortly after dawn. It was lucky for me that someone had thoughtfully been sprinkling bird seed to attract the horde of House Sparrows that vagrant Dickcissels seem to like to take up with. This made my search more of a wait, as I just sat and stared at the common brown birds until one of them magically turned into the object of my cold vigil. Look, it’s like magic! From brown to yellow in an instant! While I would have liked to have stuck around to wait for the sun to get high enough to shine on the spot where the Dickcissel was feeding I had to be content with the views and images that I could get of Spiza americana. Work, after all, was waiting. Still, it was worth the cold and the early awakening to get such looks at a relatively-rare-for-New York bird. If you want to make the attempt at the Dickcissel in Inwood Hill Park it is in the southwestern part of the park, just north of Dyckman Street. 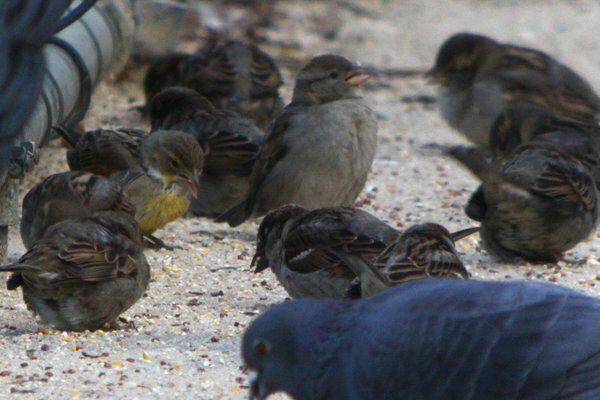 If you enter from the west end of Dyckman Street and walk north along the baseball fields you can’t miss the spot where the birds have been feeding. Good luck if you go! 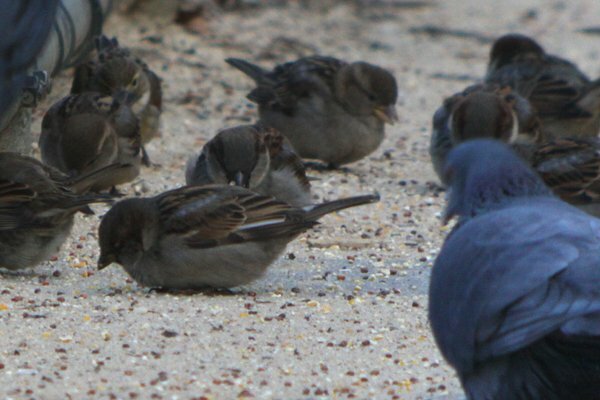 Weird how winter Dickcissels in the northeast seems to always be drawn to House Sparrows. And are Dickcissels really vagrants? They do nest in the State after all. @Nate: The innocents from the midwest always take up with bad elements when they move to coastal cities. @Doug: No more Lonely Island for you! Do You Have a Spare $10 Million? Western Tanager in Queens – Finally!